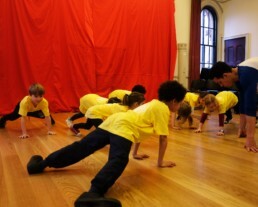 Adrenalin Dance produces movement adventures with, for and by children. Adrenalin Dance was founded in 2001 with the aim to create dance theatre for children that was inspirational and took it’s young audiences seriously. We welcome newcomers in the first two weeks of term, where it is possible to do a trial class for £4:00. After a trial class, fees are payable termly. Breakin’ ( break-dance; b boying/bgirl )Is a hip hop dance style originating in the mid 70’s in the Bronx. Breakin’ has a particular set of skills teaching coordination and flexibility, encouraging dancers individual expression. Dancers learn to improvise with their skill and creativity in battles, showcases and jams. Our beginners class starts at age 5 and teaches young dancers safe practice introducing them to this dynamic culture. toprock, get downs, footwork and power moves. Dancers in this class must have an understanding of safe practice and have some experience in breaking. Our introduction to a dance class. This is a playful first session getting to grips with being in a dance class without a carer. Left, right,top,bottom,in, out,go,stop and jump ! all to a fun soundtrack . 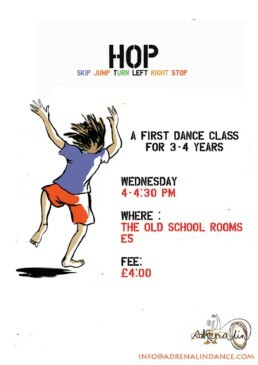 A playful funky class for young children. This fun session develops musicality, listening and coordination. Young children experience dancing in a class format moving freely and with instruction. Our theatrical dance class is influenced by a wide range of modern dance styles. We encourage students creative expression, with a Modern dance foundation informed by Cunningham, Graham and Release technique’s . Ages 2-4 years accompanied by an adult. A fun parent and toddler dance session . 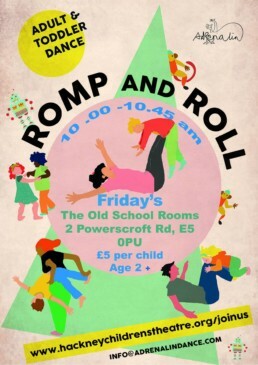 Everyone welcome ,come along take your socks off ,roar like a lion and dance !See our Romp and Roll page. We offer a 15% sibling or multi-class discount. We do not permit parents watching classes as this can inhibit some children and undermine the teachers trust and authority. Ages on classes are suggestions and we are on hand to discuss your child’s suitability. Always bring a small bottle of water to class. 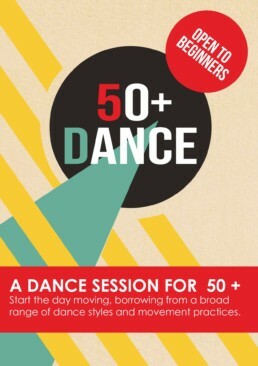 email info@adrenlindance.org to book a place!